This pork belly is slow-roasted, then sliced and served in a tasty broth with noodles, tomatoes and crunchy spring onions. You can use the roasting method here for a simple pork belly roast to be served just as it comes. First remove the bones from the pork: starting in the thickest corner, use a sharp meat filleting knife to make a cut immediately under the ribs. Keeping the knife tight to the underside of the bones, work carefully and slowly down from the corner, gradually releasing the ribs from the meat until you can remove them, all in one piece. Cut between the bones to release the individual ribs. Place these in a stockpot with the spring onion tops, garlic, ginger, chilli, coriander stems and lime zest. Pour over 1 litre water and bring to a gentle simmer over a medium heat. Cook for 1½ hours. Meanwhile, preheat the oven to 220°C/Fan 200°C/Gas 7. Place the boned pork, skin side up, in a suitably sized roasting tin. Season it well with salt and pepper and cook in the middle of the oven for about 30 minutes, or until the skin starts to blister. This is the beginning of your crackling – don’t be afraid to give the joint another 5–10 minutes at this high heat to get that blistering going (though do watch that the juices aren’t burning). Now turn the heat down to 150°C/Fan 130°C/Gas 2 and add ½ glass of water to the roasting tin. Cook the pork for a further 3 hours. Add a little more water if you need to during cooking to stop the lovely juices from the pork burning. Once the stock has simmered for long enough, pass it through a fine sieve into a clean pan. Season with salt, a good pinch of sugar, tamari or soy and lime juice to taste. Remove the pork from the oven and allow it to rest while you cook the noodles according to the packet instructions. Drain, refresh under cold water, then drain again and toss with the tiniest drop of oil, just to stop them sticking together. 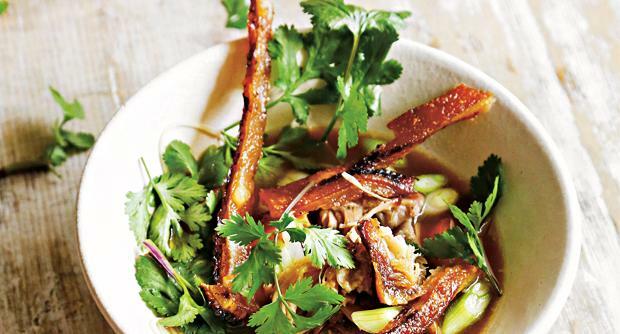 To serve, reheat the pork stock. Remove the crackling from the pork and snap it into pieces (you can give it a final blast under the grill if it’s not quite crisp enough). Quarter the tomatoes and slice the spring onions on the diagonal. Tear the pork roughly into pieces. Divide the shredded pork between large warmed bowls and add the noodles, tomatoes and spring onions. Ladle the hot stock equally into the bowls, and finish with some pieces of crackling and a generous scattering of coriander leaves.